Cancellation received 21 days+ prior to check-in : No charge. Cancellation received within 21 days before check-in: 1 night charged (20% of stay for Peak Season). Early check-out or No-show bookings - no refund. Inclusive of 2 Free round-trip transfers per day to/from Aonang Beach by our own Tuk-Tuk from 08:00-18:00 Rates are for the ENTIRE VILLA (not per person), quoted in Thai Baht per night and are inclusive of electricity & water usage, daily villa & pool cleaning. Rates are for up to 8 guests. Maximum 2 additional guests charged @ 500 Baht per guest per night (includes extra roll-away bed). We can arrange a private car for THB 600 (suitable for up to 3 persons) or a private minibus (up to 10 persons) for THB 750 for airport pickup. Welcome to Narintara Villas, Krabi. 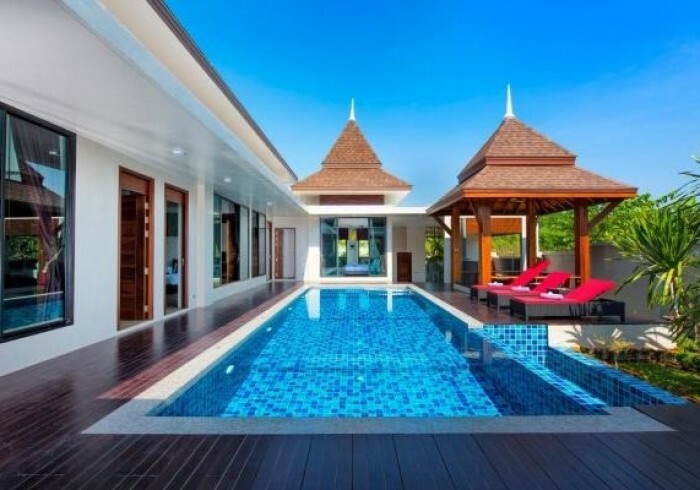 Situated in the Nathai area of Aonang, the villas are in easy reach of the beachfront (7 minutes away with our free tuk-tuk service), local islands and various day trip options. Kick back and relax by your own private pool, taking in the peace and quiet. We have a collection of 6 villas, managed from our on-site office by a dedicated 16-strong team of staff. We are a fully-licensed resort (hotel licence 70/2560).